The Editor's Weblog: Oh no, it's a Lee Clarion! Pizza publicity may be linked to "improved tips"
Face morphing application offers endless fun. Did Obama inspire Lee billboards? Oh no, it's a Lee Clarion! Lecture Hall to Black Box: What you need to know. Concerning Conn: The name that tells a tale. It didn't go home for Christmas. World's first online face transplants? Teachers: That file you can't open? Intentional. We're guaranteed a spouse at Lee, aren't we?? It's always nice to know your work is appreciated. In this video Lee University junior Jason Feliciano risks his life to rescue a stranded issue of the Lee Clarion. The Lee Clarion Editor's blog is managed by the editorial board of the Lee Clarion: Michelle Bollman, Joyanna Weber, Nathan McKay, Saralyn Norkus, Sara Dawson, Beecher Reuning and Brady Callahan. Guest posts are labeled as such. 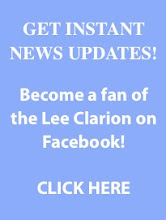 The Lee Clarion is the student news media of Lee University in Cleveland, Tennessee. The opinions, beliefs and viewpoints expressed by the authors and blog participants on this site are their own and do not necessarily reflect the opinions, beliefs and viewpoints of Lee University or official policies of Lee University.